The Motiv Trident Abyss is another heavy oil ball from Motiv. It will be released on October 3rd, 2018. It is expected to be placed at the top-left of the Motiv Ball Guide Chart, meaning that this ball will have a smooth, but powerful hook potential. This ball will fill a specific niche in your ball arsenal if your Jackal or regular Trident is just a bit too angular on the back-end. The shape produced by this ball is unlike most other balls on the market. The smooth shape combined with the strong hook potential takes this ball from just being a typical benchmark ball to also being a specific niche-filler. The Motiv Trident Abyss is a fresh ball by Motiv that has yet to be released. According to bowlerx, it will be released on October 3rd, 2018. It is rumored that bowlerx was not supposed to post the ball yet and accidentally “leaked” the information. As of now, Motiv has yet to make a public statement about this ball. For this reason, we can’t be too confident that the specs given by bowlerx are correct. However, as of this moment, I don’t see any reason to believe it isn’t true. As information about this ball is released, I will keep this article up-to-date. So for now, here’s the information we currently have on the new ball by Motiv, the Motiv Trident Abyss. *Update: The specs given in this article are now confirmed by Motiv to be true! This video was just released with some shots of the ball on the lane, and a bit more information about the coverstock. You can tell this ball is a monster on the lanes. In the video, you can see how this ball compares to the Trident and the Villian. It seems to grab a bit harder than both balls and carry well. We gotta get this ball into the hands of more bowlers to get a better idea of the on-lane action. Smooth, strong motion on heavy-oil/long patterns. This ball isn’t going to skid/flip or have a super angular motion. But it will grab and get a bit of hook on the mid-lane, and punch into the pocket while storing enough energy to carry. On the lane, it has a smooth strong hook throughout. Given that this is a heavy-oil ball, it’s going to beg you to go deep in the oil and give you a smooth action back to the pocket. 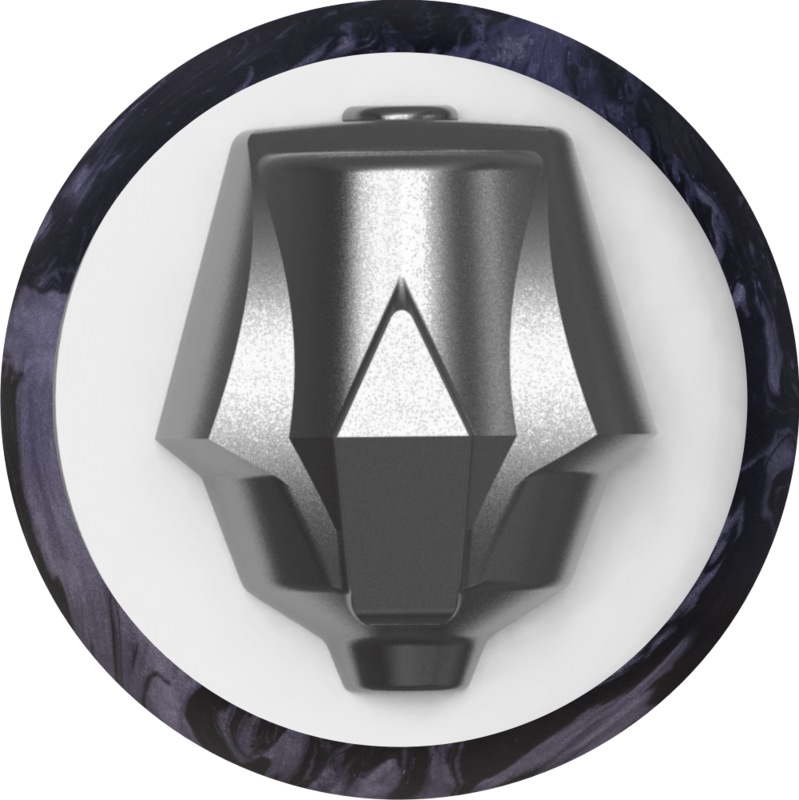 The Coercion HV3 (High-Volume 3rd Generation) coverstock is a modified version of the shell used on the original Trident, the Motiv Jackal Ghost, and the Motiv Villian. It grabs a bit more than the previous versions. As with the Villian, it will likely have a stable traction pattern, while maintaining enough power to still get some pin action. It comes from the factory with a 2000 grit LSS (Laser Scan Sanding). The Turbulent core is the same one as used in the original Trident. At a 2.49 RG, 0.054 diff, and strong asymmetry, this ball will maximize track flare. This weight block can produce a good amount of revs on the mid-lane, but it still is able to get good back-end action and continuation. The shape is quite unique, and as such will probably be a specific, yet useful niche-filler for certain conditions. What is this ball good for? Many serious bowlers are able to find a use for this ball. It is good for heavy-oil patterns when a skid/flip or angular motion isn’t what you need. This ball can fill that void in your arsenal, but honestly, if you have enough skill to require being picky about which heavy-oil ball you use, you could likely give one of your current balls a resurface. If you already own the Trident or the Jackal Rising, this may not be a necessary addition to the quiver, but if you are looking to get a new heavy-oil ball, this one is a great option. If you are exclusively a Motiv bowler, definitely pick this ball up because, at the moment, this is the strongest ball Motiv currently offers. As soon as more info is released on this ball, I will update this post with all pertaining information. Thanks for reading. What do you think of the Motiv Trident Abyss? Do you wanna get your hands on it and try it out? Do you think it’s redundant? Write a comment below with your opinion. If you want to contact me directly, feel free: bowlingiseasy@gmail.com.